The identity of the artist who painted this triptych is not known. He has in fact been named the Master of the Louis XII Triptych, after this very piece. A number of other works both in the V&A and in other public collections are attributed to him. He was active from the late 15th century to about 1515 and was clearly highly-regarded by the French court. Small triptychs such as this would have been used in a private (in this case, royal) chapel. 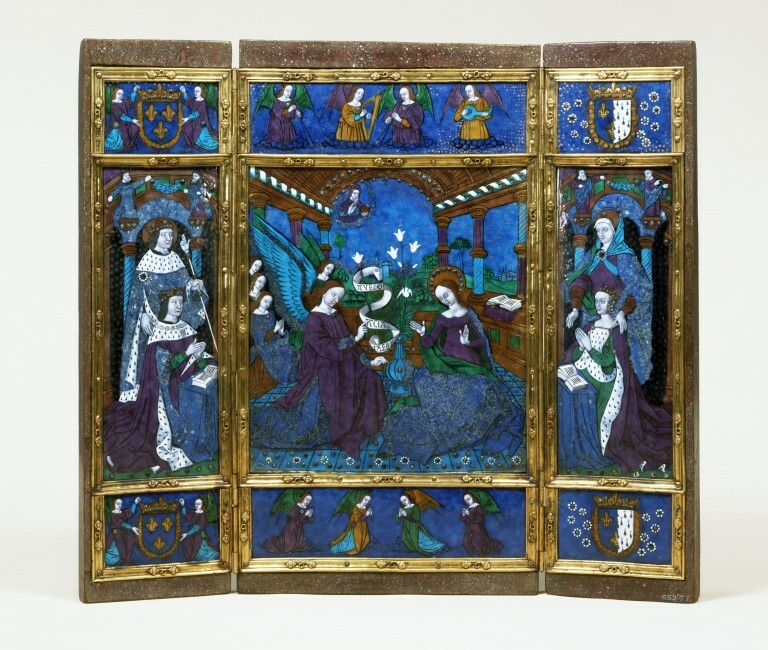 This triptych is datable to 1498-1514 on the assumption that it may have been commissioned to commemorate the marriage of King Louis XII of France (1462-1515) to Anne of Britanny in January 1499, though it might have been made as a memorial following the death of Anne in January 1514. The earliest painted enamels of the sixteenth century are akin in style, technique and subject-matter to contemporary paintings and illuminated manuscripts. It is thought that some artists were able to work in several art forms. The style of the Master of the Louis XII Triptych reflects the paintings of the Loire School - at first the style of the Master of Moulins and then after ca.1508, the style of the court painter, Jean Bourdichon (1457/8-1521). The large central panel of the triptych is an Annunciation scene in which the Archangel Gabriel announces to the Virgin Mary that she will conceive and that her son, Jesus, will be the son of God. The left wing of the triptych depicts Louis XII as donor, kneeling at a prie-dieu with his patron Saint Louis standing behind him. On the right wing is painted Anne of Brittany as donor, behind whom stands her patron, St. Anne. Six border panels bear angels praying and playing musical instruments and the arms of France and Brittany. The triptych was formerly in the collection of Henry Danby Seymour, Esq., M.P. (1820-77). Related to the Dukes of Somerset, he was M.P. for Poole 1850-68. He lent the triptych to the Special Exhibition of Works of Art of the Medieval, Renaissance and more recent periods, South Kensington Museum (later V&A), 1862. The triptych (or 'polyptych' as Sophie Baratte of the Louvre Museum calls a triptych with extra smaller border panels) is painted in polychrome enamels and gilt and is decorated with many 'paillons' (translucent enamel areas or single drops backed by foil to give a rich impression) on the floor, architecture and clothing. The triptych is mounted in a wooden frame which is painted to resemble porphyry, and is probably French, ca.1840. The large central panel is an Annunciation scene in which the Archangel Gabriel announces to the Virgin Mary that she will conceive and that her son, Jesus, will be the son of God. The Virgin, in purple gown and blue mantle with green lining, sits on a green tiled floor studded with 'paillons' as the 'Virgin of Humility' (the conventional painting term for this pose). Robert Campin (1378/9-1444) painted two such Annunciations (Brussels, and the Cloisters, New York), and such scenes were also illuminated by Jean Fouquet in the Book of Hours of Etienne Chevalier (Musee Conde, Chantilly) and Jean Colombe in a Book of Hours in the Mitchell Library, Sidney. The manuscript illuminators Jean Fouquet, (ca.1415- ca.1480), Jean Bourdichon (1457/8-1521) and Jean Colombe (ca.1430-1493) were all employed as court painters by the Kings of France. Jean Bourdichon painted a Book of Hours for Louis XII (probably dated 1498) and one for Anne of Brittany (1507). The Virgin raises her hands to the kneeling Gabriel, dressed in blue tunic and purple dalmatic. He holds a wand around which is wrapped a scroll bearing the words 'AVE GRACIA PLENA'. Behind Gabriel are four praying angels. A wooden barrel-vaulted ceiling is supported by six fluted and spiralling columns in blue and purple. Above the scene, a bust of God, surrounded by angels hovers in the air and blesses the Virgin. Between Gabriel and the Virgin is a vase of white lilies symbolising the Virgin's purity, and a hovering dove representing the Holy Spirit descending on Mary. The angel, vase and God the Father are after Schongauer and copied twice by Israhel von Meckenem, 1480-90. On the left wing of the triptych is depicted King Louis XII wearing a crown, a purple cloak lined with ermine and an ermine cope. He kneels at a prie-dieu, in the character of donor. Behind him stands his patron Saint Louis in blue with ermine and holding in his left hand a long stave mounted with the 'hand of justice'. Behind them are seen two figures of prophets on architectural brackets, which hold a garland between them. On the right wing is painted Louis' queen, Anne of Brittany, in a purple gown lined with ermine and with an ermine cote-hardie over a green dress, in the character of donor. Behind her is her patron, St. Anne in blue cloak and purple gown, behind whom are another two prophet figures on brackets with a garland. There are six smaller panels bordering the triptych. Below the King and above the Queen are pairs of angels acting as supporters to the arms of France (fleurs-de-lys). Above the King and below the Queen are shields bearing the arms of France per pale with the ermine arms of Brittany. Above and below the Annunciation are border panels each bearing four angels, four of whom kneel and pray, and the lower four of whom play musical instruments. Formerly in the collection of Henry Danby Seymour, Esq., M.P. (1820-77). Related to the Dukes of Somerset, he was M.P. for Poole 1850-68. He lent the triptych to the Special Exhibition of Works of Art of the Medieval, Renaissance and more recent periods, South Kensington Museum (later V&A), 1862. Historical significance: Louis XII (1462-1515) ascended the throne of France in 1498 and married Anne of Britanny in January 1499. She died in January 1514. 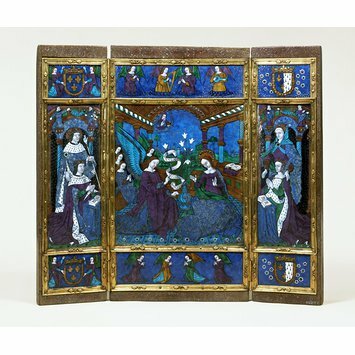 This triptych is therefore datable to 1498-1514 on the assumption that it may have been commissioned to commemorate the marriage of Louis to Anne, or possibly as a memorial following the death of Anne. The anonymous Master of the Louis XII Triptych was so-named after this particular triptych - a number of other works attributed to this artist are found in other public collections. He was active from the late 15th century to about 1515 and clearly highly regarded by the French court as he was also commissioned to paint Pierre II Duke of Bourbon (1439-1503) and his wife, Anne of France (ca.1460-1522), eldest daughter of Louis XI, on two wings of a triptych (which was in the collection of Baroness Edouard de Rothschild in Paris) at about the same time as the Master of Moulins painted the same couple on the back of the triptych which they had commissioned for the collegiate church of Moulins (now the Cathedral). The style of the Master of the Louis XII Triptych reflects the paintings of the Loire School - at first the style of the Master of Moulins and then after ca.1508, the style of Jean Bourdichon. The earliest painted enamels of the sixteenth century, such as this one, bear much similarity to images in contemporary illuminated manuscripts. The subject matter is similar and they employ the same stylistic techniques as illuminations, such as the use of gold highlights, especially for the clothes and drops of enamel to suggest jewels. It is thought that some artists were able to work in both art forms. Larger painted triptychs are usually found as altarpieces in churches. A smaller enamelled triptych would have been used in a private (in this case, royal) chapel.